Shooting stars are meteors — small pieces of dust in space that quickly burn up in Earth’s atmosphere. 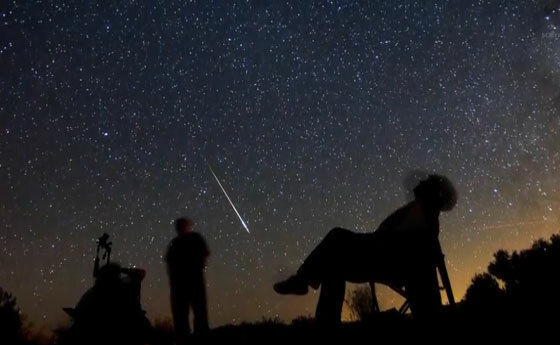 The dust particles for the Perseid meteor shower (or “the Perseids” for short) are leftover bits of a comet called “Swift-Tuttle” that flies near Earth every 133 years. As the Earth orbits the Sun, every year at about this time we pass through the dust left behind by Comet Swift-Tuttle’s many visits to our neck of the galactic woods. It’s called the “Perseids” because the shooting stars in this meteor shower all appear to fly toward us from the constellation Perseus, which is near the Name A Star Live constellations Andromeda and Cassiopeia (more info below). 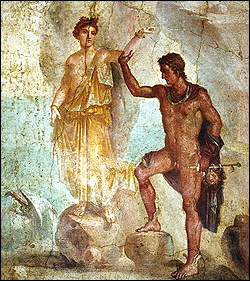 Wall painting from Pompeii found in the “Casa Dei Dioscuri” (VI,9,6) representing Perseus and Andromeda. Perseus is shown advancing to support Andromeda, who is fastened to a sea-cliff by one hand; the body of the sea-monster which Perseus has just killed is at lower left. The mythical love story of Perseus and Andromeda has been around since at least the time Comet Swift-Tuttle started visiting Earth about two millennia ago. Perseus was a famous hero in classical mythology who rescued the beautiful princess Andromeda. Andromeda’s mother, Cassiopeia (queen of Ethiopia), made the fateful mistake of boasting that her daughter was more beautiful than the daughters of Neptune, the god of the sea. As punishment, Neptune commanded the sea monster Cetus to attack Ethiopia. To appease Neptune and Cetus, the Ethiopians chained Andromeda to a rock near the seashore so as to make her a sacrifice to Cetus. The young, dashing Perseus, however, came to the rescue at the last minute, slaying Cetus and freeing Andromeda from her chains. Perseus and Andromeda then fell in love and were married! This story is commemorated in the heavens above by the constellations Perseus, Andromeda, Cassiopeia, Cetus and Cepheus (the husband of Cassiopeia) — all located near one another in space. So consider going outside under the night sky with your significant other, and make some wishes upon every shooting star you see! No telescope or binoculars needed: Just bring along a lawn chair or long towel on which to lie down. You might want to bring along some food and drink and, depending on where you live in the world, either some mosquito repellant or warm clothing. Then, just look up. Look for the shooting stars beginning after 10 or 11 pm, lasting throughout the night. The Perseid meteor shower peaks the nights of August 11-13 this year — over a weekend! Even though moonlight will interfere (making it difficult to see dimmer meteors), you might still see as many as 30 shooting stars per hour. Previous Previous post: Use the Moon to find Jupiter this Sunday! Next Next post: View the Solar Eclipse anywhere on Monday!